The Anti-Ballistic Missile Treaty (ABM Treaty or ABMT) was a treaty between the United States of America and the Soviet Union on the limitation of the anti-ballistic missile (ABM) systems used in defending areas against missile-delivered nuclear weapons. An anti-ballistic missile (ABM) is a missile designed to counter ballistic missiles (a missile for missile defense). A ballistic missile is used to deliver nuclear, chemical, biological or conventional warheads in a ballistic flight trajectory. While an "anti-ballistic missile" describes any antimissile system designed to counter ballistic missiles, the ABM treaty was signed to outlaw systems designed to counter long range, nuclear-armed Intercontinental ballistic missiles (ICBMs). Only two ABM systems have previously been operational against ICBMs: the U.S. Safeguard system, which utilized the LIM-49A Spartan and Sprint missiles, and the Russian A-35 anti-ballistic missile system which used the Galosh interceptor, each with a nuclear warhead themselves. Safeguard was only briefly operational; the Russian system has been improved and is still active, now called A-135 and using two missile types, Gorgon and Gazelle. These systems designed to protect Moscow are compliant with the ABM Treaty in their upper limits, and do not contain nuclear warheads themselves, as did previous anti-ballistic missiles. They are kinetic, not nuclear weapons, and as such are purely designed to protect the citizens of the Russian capital. The U.S. Ground-Based Midcourse Defense (GMD, previously called NMD) system has recently reached initial operational capability. It does not have an explosive charge, but launches a kinetic projectile. Signed in 1972, it was in force for the next thirty years until the US unilaterally withdrew from it in 2002. The ABM Treaty was part of the Cold War strategy of deterrence known as mutually assured destruction or "MAD." While critics would argue that it was indeed a mad policy, it did succeed during the Cold War in preventing the use of nuclear weapons after World War II. Throughout the late 1950s and into the 1960s, the United States developed a series of missile systems with the ability to shoot down incoming ICBM warheads. During this period the US maintained a lead in the number and sophistication of their delivery systems, and considered the defense of the US as a part of reducing the overall damage inflicted in a full nuclear exchange. As part of this defense, Canada and the US established the North American Air Defense Command (now called North American Aerospace Defense Command NORAD). By the early 1960s, US research on the Nike Zeus missile system (see Project Nike) had developed to the extent that small improvements would allow it to be used as the basis of a "real" ABM system. Work started on a short-range, high-speed counterpart known as the Sprint to provide defense for the ABM sites themselves. By the mid-1960s, both systems showed enough promise to start development of base selection for a limited ABM system dubbed Sentinel. However, due to political debate, Sentinel never expanded beyond defense of missile-bases. An intense debate broke out in public over the merits of such a system. A number of serious concerns about the technical abilities of the system came to light, many of which reached popular magazines such as Scientific American. This was based on lack of intelligence information and reflected the American nuclear warfare theory and military doctrines. The Soviet doctrine called for development of their own ABM system and return to strategic parity with the US. This was achieved with the operational deployment of the A-35 ABM system, which still remains the only operational ABM system to this day. As this debate continued, a new development in ICBM technology essentially rendered the points moot. This was the deployment of the Multiple Independently targetable Reentry Vehicle (MIRV) system, allowing a single ICBM missile to deliver several warheads at a time. With this system the USSR could simply overwhelm the ABM defense system with numbers, as the same number of missiles could carry ten times more warheads. Upgrading it to counter the additional warheads would cost more than the handful of missiles needed to overwhelm the new system, as the defenders required one rocket per warhead, whereas the attackers could place ten warheads on a missile with more affordable cost than development of ABM. To further protect against ABM systems, the Soviet MIRV missiles were equipped with electronic countermeasures and heavy decoys, with heavy missiles like R-36 carrying as many as 40 of them. These decoys would appear as warheads to ABM, effectively requiring engagement of 50 times more targets than before and rendering defense ineffective. At about the same time, the USSR reached strategic parity with the US in ICBM forces. A nuclear war would no longer be a favorable exchange for the US; both countries would be devastated. This led in the West to the concept of mutually assured destruction, MAD, in which any changes to the strategic balance had to be carefully weighed. To the US, ABMs now seemed far too risky—it was better to have no defense than one that might trigger a war. In the East however, the concept of MAD was almost entirely unknown to the public, studied only by those in the Soviet military and Government who analyzed Western military behavior. Soviet military theory fully involved the mass use of nuclear devices, in combination with massive conventional forces. As relations between the US and USSR warmed in the later years of the 1960s, the US first proposed an ABM treaty in 1967. This proposal was rejected. Following the proposal of the Sentinel and Safeguard decisions on American ABM systems, the Strategic Arms Limitation Talks (SALT I talks) began in November 1969. By 1972 agreement had been reached to limiting strategic offensive weapons and strategic defensive systems. Each country was allowed two sites at which it could base a defensive system, one for the capital and one for ICBM silos (Art. III). Various technical, economic and political problems led to the ABM treaty of 1972, which restricted the deployment of strategic (not tactical) anti-ballistic missiles. The treaty was signed in Moscow on May 26, 1972, by the President of the United States, Richard Nixon and the General Secretary of the Communist Party of the Soviet Union, Leonid Brezhnev; and ratified by the US Senate on August 3, 1972. For many years the ABM Treaty was, in the West, considered one of the landmarks in arms limitations. It was perceived as requiring two enemies to agree not to deploy a potentially useful weapon, deliberately to maintain the balance of power and as such, was also taken as confirmation of the Soviet adherence to the MAD doctrine. It was seen by many in the West as a key piece in nuclear arms control—an implicit recognition of the need to protect the nuclear balance by ensuring neither side could hope to reduce the effects of retaliation to acceptable levels. In the East, however, it was seen as a way to avoid having to maintain an anti-missile technology race at the same time as maintaining a missile race. The US at this time was allocating about five percent of their GDP on military spending. 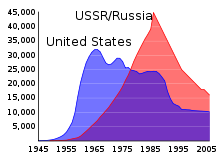 The USSR was allocating about 40 percent of their GDP, due to smaller overall economic base. The 1974 Protocol, which revised the treaty, the number of sites was reduced to one per party, largely because neither country had developed a second site. The sites were Moscow for the USSR and Grand Forks Air Force Base, North Dakota for the US, since its Safeguard facility was already under construction. Each country was allowed to deploy a single ABM system with only 100 interceptors to protect a single target. The U.S. deployed Safeguard (using Spartan/Sprint interceptors). The Soviets deployed a system named A-35 (using Galosh interceptors), designed to protect Moscow. The U.S. Safeguard system was only briefly operational. The Russian system (now called A-135) has been improved and is still active around Moscow. On June 13, 2002, the United States withdrew from the Anti-Ballistic Missile Treaty and subsequently recommenced developing missile defense systems that would have formerly been prohibited by the bilateral treaty. This action was taken under the auspices of needing to defend against the possibility of a missile attack conducted by a rogue state. The treaty was undisturbed until Ronald Reagan announced his Strategic Defense Initiative (SDI) on March 23, 1983. Reagan stated that SDI was "consistent with... the ABM Treaty" and he viewed it as a defensive system that would help reduce the possibility of mutual assured destruction (MAD) becoming reality; he even suggested that the Soviets would be given access to the SDI technology. The project was a blow to Yuri Andropov's so-called "peace offensive." Andropov said that "It is time they [Washington] stopped... search[ing] for the best ways of unleashing nuclear war... Engaging in this is not just irresponsible. It is insane". SDI research went ahead, although it did not achieve the hoped result. SDI research was cut back following the end of Reagan's presidency, and in 1995 it was reiterated in a presidential joint statement that "missile defense systems may be deployed... [that] will not pose a realistic threat to the strategic nuclear force of the other side and will not be tested to... [create] that capability." This was reaffirmed in 1997. After the dissolution of the Soviet Union in December 1991 the status of the treaty became unclear, debated by members of Congress and professors of law, Succession of the ABM Treaty, State Succession and the Legal Status of the ABM Treaty, and Miron-Feith Memorandum. In 1997, a memorandum of understanding between the US and four of the former USSR states was signed and subject to ratification by each signatory, however it was not presented to the US Senate for advice and consent by President Bill Clinton. On December 13, 2001, President George W. Bush gave Russia notice of the United States' withdrawal from the treaty, in accordance with the clause that requires six months notice before terminating the pact. This was the first time in recent history the United States has withdrawn from a major international arms treaty. This led to the eventual creation of the Missile Defense Agency. Supporters of the withdrawal argued that it was a necessity in order to test and build a limited National Missile Defense to protect the United States from nuclear blackmail by a rogue state. The withdrawal had many critics as well as supporters. John Rhinelander, a negotiator of the ABM treaty, predicted that the withdrawal would be a "fatal blow" to the Nuclear Non-Proliferation Treaty and would lead to a "world without effective legal constraints on nuclear proliferation." Reaction to the withdrawal by both the Russian Federation and the People's Republic of China was much milder than many had predicted, following months of discussion with both Russia and China aimed at convincing both that development of a National Missile Defense was not directed at them. In the case of Russia, the United States stated that it intended to discuss a bilateral reduction in the numbers of nuclear warheads, which would allow Russia to reduce its spending on missiles without decrease of comparative strength. Discussions led to the signing of the Strategic Offensive Reductions Treaty in Moscow on May 24, 2002. This treaty mandated the deepest ever cuts in deployed strategic nuclear warheads, without actually mandating cuts to total stockpiled warheads. ↑ Moscow extends life of 144 cold war ballistic missiles The Guardian. Retrieved September 19, 2008. ↑ 2.0 2.1 William E. Odom, The Collapse of The Soviet Military (Yale University Press, 1998, ISBN 9780300074697). ↑ Pravda, March 27, 1983. ↑ ABM Treaty: Memorandum of Understanding Retrieved September 19, 2008. ↑ "Announcement of Withdrawal from the ABM Treaty" White House press release. Retrieved September 19, 2008. Anti-Ballistic Missile Treaty Retrieved September 19, 2008. 1974 Protocol Retrieved September 19, 2008. Anti-Ballistic Missile Treaty The Nuclear Information Project. The Anti-Ballistic Missile (ABM) Treaty at a Glance Arms Control Association. History of "Anti-Ballistic Missile Treaty"
This page was last modified on 5 April 2016, at 15:07.